Not many players can say they had a career like Andrea Nichols. In high school at Hibbing/Chisholm, she led the state in scoring twice and was named all-state for three consecutive years. Upon graduating, she had scored 267 goals and 184 assists for 451 points over her five-year career. As a senior in 2003, she was named Ms. Hockey. But she wasn’t done. She went on to star for the University of Minnesota, serving as captain for two years and helping lead the Gophers to two national titles in 2004 and 2005. After her college career she played for the Minnesota Whitecaps and currently serves as an assistant coach with the Concordia College (Moorhead, Minn.) women’s hockey team. Sarah Erickson’s high school hockey career began in Roseau where she played her eighth and ninth grade seasons before making the move to Bemidji. In all, she would tally 290 points in her five-year career, earning all-state honors three times and being named Ms. Hockey in 2008. She would go on to play at the University of Minnesota where she served as a two-time captain and helped lead the Gophers to the national title in 2012. She also played for the U.S. Women’s National team in 2013 and played for the 18-under squad as their first ever captain. Erickson’s passion for the game extended to coaching as she also served as head coach of the Concordia College (Moorhead, Minn.) women’s hockey team. Taylor Heise’s storied career is well-known in the State of Hockey, but there is still much to be done. The 2018 Ms. Hockey winner is a freshman at the University of Minnesota after she led her Red Wing team to the state tournament last year. Heise scored 180 goals in six years as a varsity player at Red Wing, helping lead her team to state four times. In her final three seasons, she eclipsed the 40-goal mark each year with 42, 45 and then 58 last year as a senior. Heise also competed on the 18-under squad for Team USA. She currently is fourth on the Gophers in scoring with 16 points on the season. Just 18 years old, Heise is part of Minnesota hockey lore with still lots of hockey left to play. 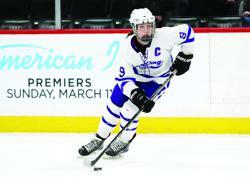 Milica McMillen is considered one of the best offensive defensemen to come out of the state of Minnesota. The 2012 Breck graduate helped lead her team to a state title her senor season, capping her career with 248 points in six years as a varsity player. Her talents brought her to the University of Minnesota where she excelled for four years, notching 120 points and becoming a three-time national champion (2013, 2015, 2016). After her college career, she was drafted into the NWHL and played one season for the New York Riveters. McMillen currently serves as an assistant coach at Ohio State University.